Oceanblue is about style and quality. If you are looking for the best then here it is. Luxury accommodation in four spacious en-suite bedrooms - large sitting and dining area, extensively equipped kitchen, designer furnishings throughout and all in a spectacular setting. Oceanblue is the perfect place to unwind and relax. Its tastefully designed and fitted out as a luxury home from home. The description of the villa hardly does it justice and youll be pleased with the high standard of every aspect. The decor, well equipped kitchen and comfortable beds and sofas will all contribute to a delightful respite from work. If you have to keep in touch of course there is internet access and the ground floor bedroom can double as a study. Set in a beautiful location we have tried to create an environment in harmony and facilities such a bicycles and snorkelling equipment so you can experience the beauty of the local environment. Oceanblue is equipped as a year round villa so the pool can be heated if required so it is warm enough to swim in throught the year and the villa has heating for winter use. 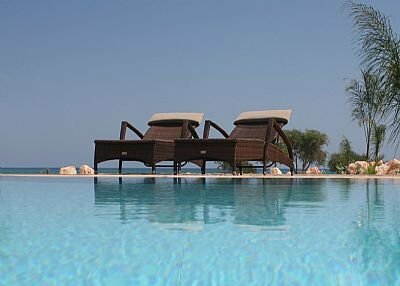 A great choice for anyone who wants a luxurious base from which to explore Cyprus or just relax at any time of the year. The large south facing garden leads directly to the sea whilst the pool and sun deck provide space to enjoy the sun. Outside lounge areas make the most of the view and the BBQ and bar is perfect for alfresco dining and evening entertaining. The spacious open plan sitting and dining areas, well equipped kitchen. Cable TV, satellite, PS3, Wii and interior and exterior sound system will keep you entertained in comfort. The master bedroom has spectacular sea views and its own patio area with comfy chairs. The second bedroom has a four poster bed, silk bedcover and cushions. Bedroom 3 is a large twin bedded room with TV and DVD player and the ground floor twin room includes a TV and PS2. Oceanblue is located on one of the most beautiful stretches of shoreline in Cyprus, near to the picturesque fishing harbour of Potamos and local beaches. Its in a peaceful setting on the sea front, but less than two minutes drive to Agia Napa Water Park, five minutes to Nissi Beach and ten minutes to the centre of Agia Napa where you can enjoy the extensive night life and a few minutes more to Protoras and Paralimni. The nearest airport is Larnaca which is only a thirty minutes drive. The large landscaped garden runs directly to the sea with magnificent south facing views across the Mediterranean. The development of Ionion, where Oceanblue is located, has become a local oasis. The front line villas are privately owned and occupied and the neighbours have created a friendly community have lavished care and attention on their properties and the local area. The immediate area is quite beautiful with the villas very close to the sea and the sea itself very sheltered and ideal for snorkelling and fishing. The Potamos creek and fishing shelter is unique providing a base for scores of traditional fishing boats and a good fish restaurant. The villa faces south so is blessed with full sun all day and the silvery reflection of the moon un the water many nights is quite breathtaking. There is a beach next to the villa but the shoreline is of gently shelving flat rocks and ideal for swimming or snorkelling. On the other side of the creek there are a few small sandy beaches which are little used. If you love fish, then Potamosis the place to visit! It is only a short walk away, even quicker by car, and here you will find two excellent restaurants with traditional Cypriot hospitality. One restaurant overlooks the estuary and the other overlooks the Mediterranean. Here you can relax in a non tourist environment enjoying fresh fish straight from the sea. There is a small convenience store within walking distance of the villa, and large supermarkets in Agia Napa and Paralimni. Apart from the local fish restaurant there are good village restaurants in the villages of Liopetri and Sotera and Paralimni and many tourist restaurants on the way to and in Agia Napa. Waterworld (the main water park in Cyprus) is just two minutes drive from the villa as is the nearest beach with water sport facilities at Agia Thekla. Just beyond this are a number of restaurants, supermarkets and banks and the blue flag Nissi beach with extensive water sports and other facilities is just five minutes from the villa. The centre of Agia Napa with its restaurants, bars, funfair, clubs, historic sites and harbour is just a further five minutes. Beyond Agia Napa is the conservation area of Cape Greco with unspoilt scenery and famous sea caves popular with divers. Diving can be arranged through one of many dive centres in Agia Napa or Protoras. Sitting room includes TV, DVD, Playstation 3 console, Nintendo Wii console, multi area HIFi sound system with Ipod dock and wireless broadband. There is a 2nd Playstation 2 console and TV/DVD in the twin bedroom. Some snorkelling equipment is provided and two Cycles, so you can make te most of the beautiful location. A pay as you go mobile phone is provided for your use whilst staying in the villa.